copy of Vermeer’s Lace Maker. 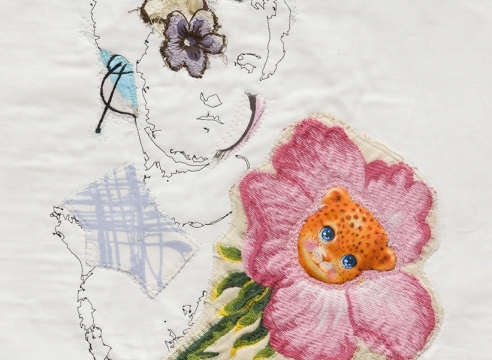 China Marks creates beautifully chaotic works that are inspiring, new hybrids of embroidery, drawing, and collage. Her dense process-driven creations can initially be described as drawing with thread into fabric fragments, with which she constructs twisted tales. Over time she builds up her creations by working and re-working thread upon thread, with fabric collage that is applied, removed, and reshaped. Combined with addition of digitally embroidered sketches and text, the end result is a wonderous landscape filled with warped characters, dark humor and dense narratives.